The Lord Mayor’s Hot Air Balloon Regatta® is the official ballooning event of The City of London and is the aerial extension of the historic Lord Mayor’s Show. 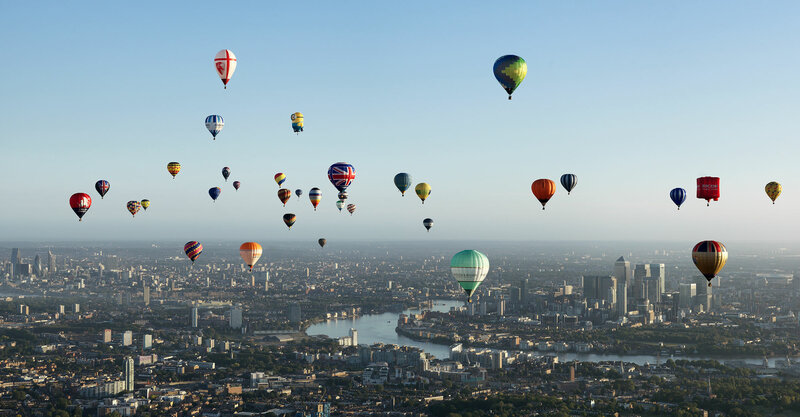 Each year up to fifty hot air balloons take flight across central London raising awareness and funds for the Lord Mayor’s Appeal. Leading the launch is the official Lord Mayor’s Appeal hot air balloon which carries both the Lord Mayor and Lady Mayoress. The 2017 event took place on September 10th from the unique launch location of London City Airport’s runway, see gallery and updates for more information. We are delighted to confirm that the official standby dates for The 2019 RICOH Lord Mayor’s Hot Air Balloon Regatta® are Sunday June 2nd, 9th, 16th and 30th. For this year’s flight, we will be launching from Battersea Park. The prevailing wind should allow for another stunning and unforgettable flight over Buckingham Palace, Houses of Parliament, London Eye and Tower of London. Due to the weather dependent nature of hot air ballooning, this event is on standby for a Sunday morning and will proceed on the first available date when the weather is suitable. To become a Corporate Partner and have your livery fly over London as part of the 2019 Lord Mayor’s Hot Air Balloon Regatta®, please contact us here.